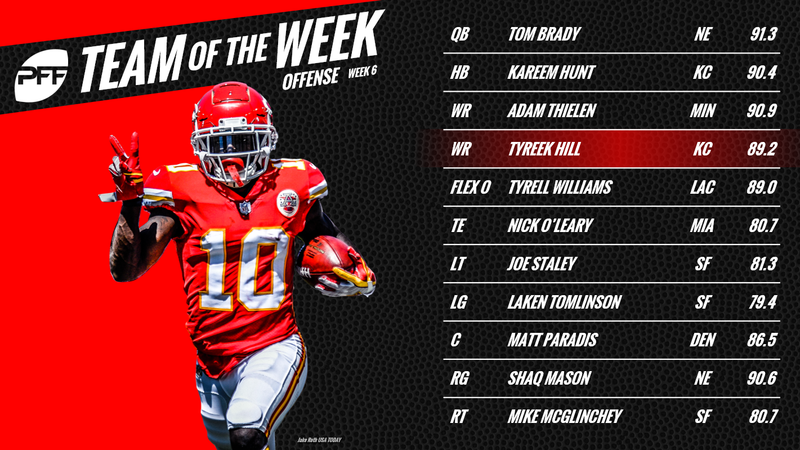 It is time again for the PFF NFL Team of the Week – highlighting the best individual performances from the weekend’s worth of action. The team format will match the improved All-Pro system when it comes to offensive and defensive formation, with a flex player for both sides of the ball that can be either a receiver, slot weapon, tight end or running back on offense, and anybody in the defensive secondary on defense. This gives us the flexibility to reward the player that best deserves it across multiple positions, rather than shoehorning in somebody just to fit a slot receiver or cornerback role. We lend some weight to playing time, and a variety of factors are considered, but these will largely be the best-graded players at their respective positions throughout the league. This year, our Team of the Week will be coming out before Monday Night Football has been played, featuring the best performances from the Thursday Night and Sunday games. In the occurrence that a performer on Monday night is worthy of a spot on the team, this list will be updated and those with standout performances from the weekend will still be appreciated. Check out all of our regular season advanced statistics and information including every player’s grade with PFF Elite and Premium Stats 2.0. Patrick Mahomes had been writing the headlines so far this season but Tom Brady reminded us why he’s still among the best in the league with a vintage performance on Sunday Night Football. He was clinical when the Chiefs couldn’t get pressure on him, completing 21-of-29 passes for 300 yards, but even when they were able to get pressure he still got it done, with his lone touchdown of the evening coming when a pressure was recorded. Hunt carried the ball just 10 times in the game but forced two missed tackles, picked up three first downs and had two runs of 10 or more yards. His biggest impact was felt as a receiver, where he picked up five receptions for 105 yards and a score, coming on just 17 snaps as a receiver. That gave him a yards per route run average of 6.18, leading all running backs this week. Six games in a row. Nobody in the Super Bowl era had opened the season with six straight 100-yard games, but that is exactly what Thielen accomplished yesterday. From 39 snaps as a receiver, he picked up 123 yards on 11 receptions, giving him a yards per route run average of 3.15. At this point, the big question is how long he can keep the streak going. If there was any doubt that Hill could be a star receiver in the NFL, he’s removed it so far this season. A threat to create a big play every time he touches the ball, he averaged 3.84 yards per route run on Sunday, with seven receptions for 142 yards from 37 snaps as a receiver. Williams was the big-play threat for the Chargers on Sunday, finding two huge consecutive plays downfield, including the touchdown he wrestled from the Browns defense. On the day, he caught all three passes thrown his way, with all of them traveling 20-plus yards in the air, good for 118 yards and two touchdowns. Staley rolled back the years with another fine performance on Monday Night, not allowing a single sack, hit or hurry from 29 pass-blocking snaps. On the year, he has allowed just 10 total pressures through six games. A first-round draft pick back in 2015, Tomlinson has started to find his groove for the 49ers over the past two weeks. Against the Packers, he allowed just one hurry from 29 pass-blocking snaps and was impressive as a run-blocker. When he’s on, Paradis is one of the very best centers in the NFL, and it showed on Sunday. From 50 pass-blocking snaps, he didn’t allow a single sack, hit or hurry, and he was impressive on the Broncos 16 rushing plays as well. 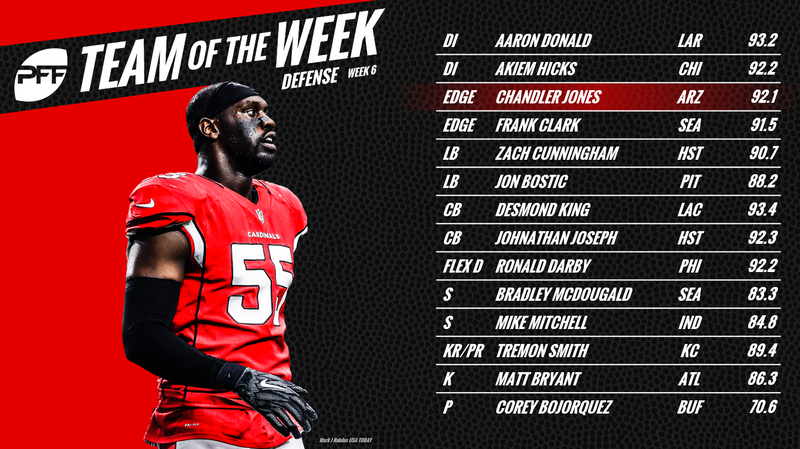 The second guard from the Patriots in this week’s Team of the Week, Mason was the best offensive lineman in the league in Week 6. From 41 pass-blocking snaps, he didn’t allow a single sack, hit or hurry, and he was utterly dominant as a run-blocker. The 49ers first-round draft pick delivered for the second week in a row, excelling as a run-blocker and allowing zero sacks, hits or hurries from 29 pass-blocking snaps. Over the past three weeks, he has now allowed just three hurries, with no sacks or hits. After delivering his highest-graded game of the season to date a week ago, Jones bettered that again this week. From 35 pass-rushing snaps, he racked up two sacks, four hurries, a batted pass and a forced fumble. The Cardinals didn’t pick up the win, but Jones still dominated off the edge. Donald rushed the passer 46 times on Sunday, racking up a sack, a hit and 10 hurries in the process. Generating pressure on more than a quarter of his pass-rushing snaps, Donald has now registered four sacks, four hits and 33 hurries through six games this season. Hicks was an absolute monster on the defensive interior for the Bears, as he has been for much of the season. As a pass-rusher, he registered a hit and a hurry, but it was against the run where he was almost unblockable. By the end of the game he had registered seven tackles resulting in a defensive stop, the most of any player on the defensive interior this week. Clark played just 29 snaps on Sunday, but 23 of those came as a pass-rusher, with Clark racking up three sacks, a hurry and a forced fumble. By far his best game of the year, it moves him to six sacks, three hits and 15 hurries through six games. Cunningham had struggled for much of the season but we saw some improvements last week before he delivered a dominant performance against the Bills in Week 6. He registered a hurry on both of his blitzes, allowed just two yards from three receptions in coverage and finished the game with six tackles resulting in a defensive stop. Bostic was targeted three times on his 19 snaps in coverage but only allowed one reception for nine yards, while coming away with a pass breakup. He was solid against the run as well but ultimately it was his ability to help the Steelers in the middle of the field in coverage which saw him earn his spot here. King had been up and down so far this season but delivered his best performance of the year in the Chargers win over the Browns. Targeted eight times in coverage, he allowed just 40 yards from five receptions and registered two pass breakups and an interception. When all was said and done, he had allowed a passer rating of 35.4 on throws into his coverage. Joseph was targeted 10 times in coverage, but it’s something that both Bills quarterbacks surely regret. He allowed just four receptions for 51 yards, and also came away with the defining play of the game with a pick-6 off of a poor Nathan Peterman pass, giving the Texans a much-needed win. McDougald allowed four receptions from five plays where he was the primary defender in coverage, but those four receptions went for a total of just 19 yards. It’s been a career year for him so far, and he is currently the highest-graded safety to have played 250 or more snaps this season. Six days after signing with the Colts, Mitchell finds his way onto our Team of the Week. Mitchell attempted seven tackles in the loss to the Jets and didn’t miss a single one. Of those seven tackles, five resulted in a defensive stop and, while he allowed a reception on both of the plays where he was the defender in primary coverage, those two receptions went for a combined six yards. Darby was targeted six times by Eli Manning in the Eagles win over the Giants on Thursday Night Football but allowed just one reception for no yards whatsoever. Showcasing his ability to make plays on the ball, Darby finished the game with four pass breakups to boot. He’s still got it. Bryant made both of his field goal attempts in the win over the Tampa Bay Buccaneers, including a 57-yarder. On the season he is now 9-of-9, including 3-of-3 from 50-plus yards. Bojorquez punted six times on Sunday, averaging 40.0 net yards per punt. Three of his punts landed inside the Texans 20-yard line, and while he had a punt blocked, that wasn’t on him. As if the Chiefs didn’t have enough speedy playmakers already, Smith showed why there is another player to be fearful of every time he touches the ball with a 97-yard kick return in the loss to the Patriots. Howell was a force for the Texans on special teams, registering two tackles and forcing a fumble on his five snaps in kickoff coverage. He also saw time on the kick return, punt return and punt coverage units.